Designed for professional printing, the large-format Canon ImagePROGRAF iPF840 colour inkjet printer can handle a wide range of media from cut sheets to rolls. It offers quick print speeds and delivers exceptional quality. Thanks to its LUCIA ink system, users of the Canon iPF840 large format printer can expect a wider colour reproduction. Wi-Fi connectivity isn't available. 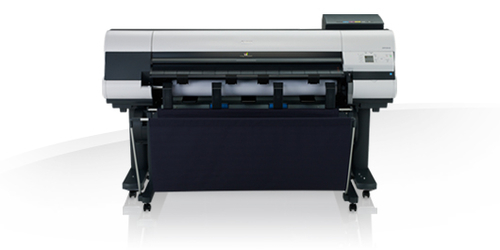 The Canon ImagePROGRAF iPF840 44" large format inkjet printer weighs 189kg and measures 1893 x 1291 x 1144mm. It has USB and Ethernet interfaces. This model features a high capacity basket for maximum productivity. It also has hot-swap Canon iPF840 ink tanks that allow for easy changing even in the middle of a print job. Thanks to a built-in 320GB hard disk drive, the ImagePROGRAF iPF840 colour plotter is ideal for high-volume printing. It can even be used for continuous printing of rolls. This model is quick, delivering A0 rolls in less than an hour on economy mode. Accounting software is available to help users keep track of ROI as well as manage costs. The Canon ImagePROGRAF 840 CAD printer promises clearer quality for CAD drawings to allow for more precise details. Workgroups can easily share the unit with its standard Ethernet connectivity. More people could easily access the Canon iPF840 inkjet printer if it had Wi-Fi connectivity. This model could also use a better control panel with larger display. The Canon ImagePROGRAF iPF-840 printer can take up a lot of space.